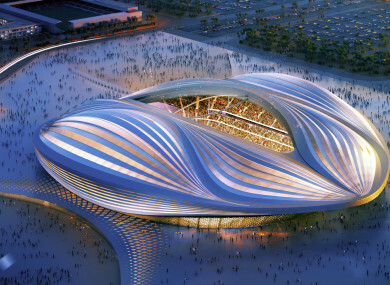 QATAR’S WORLD CUP bid team has strongly denied allegations it conducted a smear campaign to increase their chances of hosting the 2022 tournament. Any such campaign would be in breach of FIFA regulations, but Qatar’s Supreme Committee for Delivery & Legacy has hit out at the allegations and insisted it has fully complied with world football’s governing body. “The Supreme Committee rejects each and every allegation put forward by the Sunday Times,” said a statement. “We have been thoroughly investigated and have been forthcoming with all information related to our bid, including the official investigation led by US attorney Michael Garcia. Qatar’s World Cup preparations have been mired in controversy, with concerns raised about allegations of corruption and soaring temperatures in its summer months, while Amnesty International has expressed fears over the treatment of migrant workers in the country. The Supreme Committee introduced official guidelines on workers’ welfare standards, which was updated this year following consultations with Amnesty and other human rights groups. Email “Qatar World Cup organisers deny 'black operations' claim”. Feedback on “Qatar World Cup organisers deny 'black operations' claim”.